Having your water supply contaminated by backflow is no laughing matter.It is for this reason that many cities and municipalities have been quick to make certain that the Uniform Plumbing Code is strictly enforced; this means eventually requiring that all residential and commercial properties have a backflow preventer installed to avoid potential contamination. Your potable water supply stays safe from any type of impurity due to backflow prevention devices. When you open your faucets and water flows out, you likely don’t give it another thought. However, if there is a noticeable drop in water pressure, you could be at risk for a backflow. Backflow occurs if your water reverses and contaminates your water supply, rather than being carried out and away as usual. As the best backflow prevention device installation and repair company in San Diego, we have a professional team of technicians who can perform backflow testing or device installation. Contact our plumbers today at (619) 345-5550 to schedule an appointment or request a free quote. We help homeowners in San Diego. A backflow is a flow of used water or waste from any industrial, institutional or residential plumbing system into the clean water supply system that is reversed from the usual or expected flow of the water system. Instead of flowing “out” the waste or used water flows “back” and can contaminate the water used for drinking, bathing or washing. This flow reversal can be caused by a significant water pressure change, such as when the water pressure at the supply point is lower than the water pressure at the point where the faucet is turned on. If this happens the water at the point where the faucet is turned on (point of use) gets pulled back into the system and can contaminate the rest of the water. If this sort of a problem goes untreated, it can eventually back up into the public water system. If you have a backflow preventer installed in your home, you should have it professionally tested on a yearly basis. In the event that you do not have a backflow preventer device, you may want to consider the installation of one. This type of device is effective in detecting if a backflow is going to occur and helping to prevent the reversal of water and contamination of water flowing into your supply. There is a point where the clean water can come in contact with the contaminated water, possibly from a sewer line, and this point is called the cross connection. In order to prevent this backflow, a backflow prevention assembly is installed at the point of a cross connection. The installed backflow prevention device has to match the location’s specific hydraulic conditions to prevent the degree of contamination that could occur in those particular conditions. While there is a good deal more information regarding the installation of backflow preventers, you can relax, knowing that should you need these kinds of services, our certified and expert technicians to take care of all your backflow prevention needs. 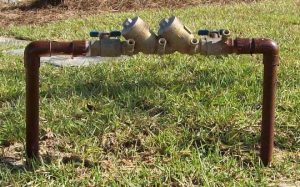 If you wish to discuss the particulars of backflow prevention, the technician who does your evaluation will be able to give you a clear picture of your property’s particular backflow prevention needs. Since we are the best backflow device installation and repair company in San Diego, our licensed professionals are skilled at determining if a backflow device is effectively keeping you safe or if it is inefficient and putting you in danger by performing backflow testing. If upon the completion of our inspection we find that your plumbing system may be at risk, we will recommend that you replace your device. In most cases, these devices should be replaced every five years. Call us today for a plumbing service estimate from San Diego’s top rated plumbers. If you are interested in learning more about the importance of backflow prevention services in San Diego, give us a call at (619) 345-5550.